It is very important to understand the gravity of current affairs in IAS Exam. An aspirant cannot go without studying current affairs for any level of IAS Exam. Here, we have provided current affairs quizzes based on the recent events happened around the corners, quite useful for UPSC IAS Prelims Exam. There is hardly three months remains for IAS Prelims Exam, so, by wasting no time the IAS aspirants should gear up for the upcoming IAS Prelims Exam 2017. 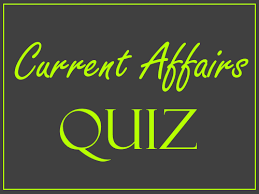 Here, we have provided a current affairs quiz for the preparation IAS Prelims Exam. I. Investment for generation component of Arun-3 HEP (900 MW) for an estimated cost of Rs. 5723.72 crore at May 2015 Price Level. II. Completion period of the project shall be 60 months from the date of financial closure which is planned for September this year. III. The project is located on Arun River in Sankhuwasabha District of Eastern Nepal. Investment for generation component of Arun-3 HEP (900 MW) for an estimated cost of Rs. 5723.72 crore at May 2015 Price Level. Completion period of the project shall be 60 months from the date of financial closure which is planned for September this year. Ex-post facto approval for the existing implementing agency, already incorporated in the name of SJVN Arun-3 Power Development Company (P) Limited (SAPDC) registered in Nepal as a 100% subsidiary of SJVN Limited for implementing the project. Any component of work already or being made by the Nepalese authorities shall be so certified by Central Electricity Authority (CEA) and shall be accordingly deducted from the project cost requirements. The project is located on Arun River in Sankhuwasabha District of Eastern Nepal. The Run-of-River scheme envisages about 70 mtrs high concrete gravity dam and Head Race Tunnel (HRT) of 11.74 Km. with underground Power House containing four generating units of 225 MW each on Left Bank. I. The Solar Parks and Ultra Mega Solar Power Projects will be set up by 2019-20 with Central Government financial support of Rs.8100 crore. II. The total capacity when operational will generate 64 billion units of electricity per year which will lead to abatement of around 55 million tonnes of CO2 per year over its life cycle. The Cabinet Committee on Economic Affairs, chaired by the Prime Minister has approved the enhancement of capacity from 20,000 MW to 40,000 MW of the Scheme for Development of Solar Parks and Ultra Mega Solar Power Projects. The enhanced capacity would ensure setting up of at least 50 solar parks each with a capacity of 500 MW and above in various parts of the country. Smaller parks in Himalayan and other hilly States where contiguous land may be difficult to acquire in view of the difficult terrain, will also be considered under the scheme. The capacity of the solar park scheme has been enhanced after considering the demand for additional solar parks from the States. 3. Recently, scientists from India have discovered seven new frog species belonging to the genus Nyctibatrachus, commonly known as Night Frogs from which of the following regions of India? Indian Scientists have discovered seven new frog species belonging to the genus Nyctibatrachus, commonly known as Night Frogs. They are as small as a five-year-old child’s thumbnail; and leap out of their daytime hideouts after sundown to croak to life the Western Ghat jungles with their signature cricket-like chirps. They are among seven new species of frogs, some of the tiniest in the world that were discovered by Indian scientists. These nocturnal amphibians measure between 12.2mm and 15.4mm. The discovery makes the rich but eco-sensitive Ghats the second-largest global amphibian hotspot after Brazil’s Atlantic Forest, a research paper reported on Tuesday. The discovered species named after the place of discovery such as Sabarimala and Athirappilly in Kerala as they were found inside “damp tree leaf litter or marsh vegetation” -- unlike night frogs that predominantly reside along streams. That was a probable reason why these elusive frogs were out of sight until the 21st century. The miniature species are locally abundant and fairly common, but they have probably been overlooked because of their extremely small size, secretive habits and insect-like calls. I. Nearly a third of Indian cities have breached annual pollution limits mandated by the Central Pollution Control Board (CPCB) between 2011 and 2015, according to figures from the Union Environment Ministry-affiliated organisation. II. CPCB data show that 94 cities spanning States from Andhra Pradesh to Jammu and Kashmir and Assam to Gujarat were guilty of breaching the annual, particulate matter limit of 60 micro-gram per cubic metre. III. The cities like Delhi, Mumbai and Pune measure PM2.5 levels, most lack the sensors required to gauge the presence of these minute particles that are considered more toxic than the more-commonly measured PM 10. 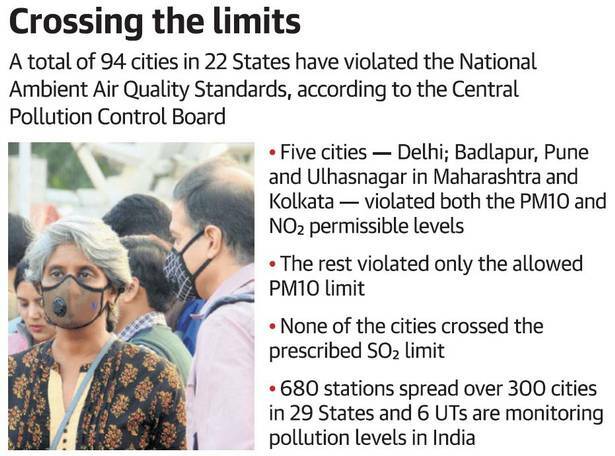 Nearly a third of Indian cities have breached annual pollution limits mandated by the Central Pollution Control Board (CPCB) between 2011 and 2015, according to figures from the Union Environment Ministry-affiliated organisation. The numbers — the latest available and updated in blocks of 4 years — sourced from 680 pollution-monitoring stations spread over 300 cities across the country, measure levels of particulate matter (PM 10), nitrogen dioxide (NO2), and sulphur dioxide (SO2). While cities such as Delhi are usually the worst performers with regard to pollution spikes in winter, the CPCB data show that 94 cities spanning States from Andhra Pradesh to Jammu and Kashmir and Assam to Gujarat were guilty of breaching the annual, particulate matter limit of 60 micro-grams per cubic metre. I. The project involves the delivery, installation and commissioning of radar systems on Navy vessels as well as delivery of simulators, establishing depot level facilities and integrated logistics support with deliveries spread over 10 years. II. The proposed radar is based on the latest solid state technology and also suited for coastal surveillance applications. The Defence Ministry has signed a contract with Nova Integrated Systems Ltd (NISL), a subsidiary of Tata Advanced Systems Ltd (TASL), to execute the Navy’s Surface Surveillance Radar (SSR) project. This is the first procurement by the Ministry under the ‘Buy and Make (Indian)’ category of the Defence Procurement Procedure (DPP). The project involves the delivery, installation and commissioning of radar systems on Navy vessels as well as delivery of simulators, establishing depot level facilities and integrated logistics support with deliveries spread over 10 years. The proposed radar is based on the latest solid state technology and also suited for coastal surveillance applications. Procurement of SSR is part of Indian Navy’s plan for modernisation of its fleets. It would also be installed on the ships under construction. Facilities at TASL’s Combat Management Systems development centre will be utilised for the project, which involves integration of the radar with a variety of weapon and sensor systems on different class of vessels of the Navy’s Battle Assets.